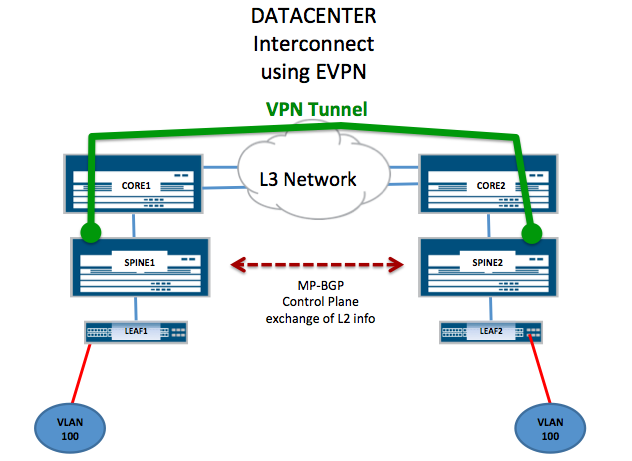 EVPN (Enhanced VPN or Ethernet VPN) is a great technology for stretching Layer 2 between Data Centers (aka Data Center Interconnect or DCI). It uses MP-BGP for control plane exchange of Tenant information and mac-addresses. Data Plane traffic is tunneled inside a tunneling protocol such as MPLS, VXLAN or PBB. EVPN is used in lieu of VPLS because it provides better control over BUM traffic (Broadcast, Unknown Unicast, and Multicast). It also supports the ability to forward traffic over multiple active paths and Multihoming. EVPN used over MPLS provides the benefits of traffic engineering and fast convergence. In part I, I've created a small single-homed setup to show how this works. The first step is to create the trunk port facing the Leaf switch. The leaf switch is a standard TOR switch with no special config. I created a sub-interface and placed it into a routing instance. Instance configuration looks like a normal VPLS configuration except for the instance-type and evpn protocol parameters. Next I configure BGP to exchange control plane info. A new address family is used called evpn. After that, the normal MPLS, your flavor of MPLS signaling and IGP protocol configuration is used as well as the Core MPLS facing interfaces. Once configured, MP-BGP exchanges "control plane" information. This shows you locally learned macs and macs learned over the WAN. In Part II I'll go more into configuring Gateway information to prevent the trombone effect.